Muscle Maker Gainer By Giant Sports | Muscle Maker Bulking Protein comes in 6lbs tubs and 12lbs bulk bags in stock and ready for delivery. Only the best serves on all Giant Sports Protein Body Building Supplements. Looking for a protein supplement to support your development? 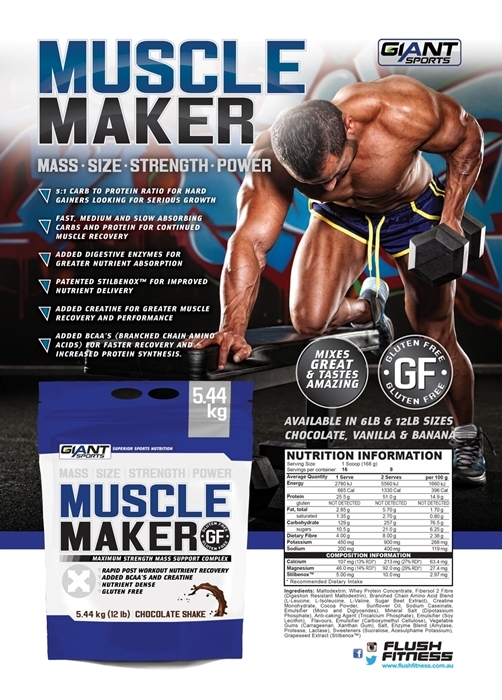 Muscle Maker by Giant Sports.Muscle Marker is a 5:1 carbohydrate to protein ratio is perfect for anyone looking to build size. It includes fast, medium & slow releasing carbs for sustained energy & muscle recovery, along with added creatine for greater performance & BCAAs for increased protein synthesis. Its added digestive enzymes will help leave that bloat behind – it’s also gluten-free! Muscle Maker Gainer - Mass. Size. Strength. Power. Maximum Strength Mass Support Complex. Added BCAA's, Creatine and Betaine. Rapid Post Workout Recovery. No Added Sugar. No Trans Fat. Gluten Free. Muscle Maker - The name says it all. Adding quality lean mass isn't as easy for some people as it is for others. 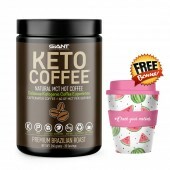 Some people naturally have smaller appetites or very fast metabolisms while many people just don't have the time to consume the quality protein, nutrients and calories that are absolutely required to ignite & sustain the muscle making process. Enter Gian Sports Muscle Maker - a scientifically designed, protein rich, absolutely delicious mass gainer product, formulated specifically to provide the ideal ingredients in the proper amounts and ratios to help the educated athlete pack on quality lean muscle super fast. 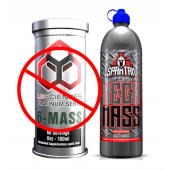 If you are a traditional "hard gainer" or just someone who needs to bulk up and add strength and size as fast as possible, Gian Sports Muscle Maker may help you to generate maximum muscle size and strength from your training while Muscle Maker may help you to generate maximum muscle size and strength from your training while tremendously aiding in recovery from intense workouts. When taken prior to training, the intense muscle fullness you will experience will let you know that Muscle Maker is working from the very first dose. Nutrient Dense, Instantly Mixable, and it tastes great. In a shaker, blender or glass add one level scoop (36g) to 6-8 oz. of cold water, fat free milk or your favorite beverage according to desired taste. Shake, blend or stir until well mixed and dispersed. Consume immediately. May be blended with half a cup of ice cubes and half a cup of your favorite beverage for a cold, delicious treat. For optimal results, consume one to three servings per day. -Right After Exercise: Consume as a protein supplement immediately following exercise to support lean muscle and promote recovery from exercise. -Any Time of the Day: Use as a convenient and delicious way to supplement your protein needs in the morning, afternoon or in the evening. The protein and fiber in this product help satisfy hunger and support feelings of fullness. maltodextrin, whey protein concentrate, fibersol 2 soluble fiber, amino acid bland (l-leucine, l-isoleucine, l-valine, betaine), creatine monohydrate, cocoa powder, natural and artificial flavors, sunflower oil, gum blend (carboxymethyl cellulose gum, carrageenan, xanthan gum), sodium caseinate, mono and diglycerides, dipotassium phosphate, tricalcium phosphate, soy lecithin, enzyme blend (amylase, protease, lactase), salt, sucralose, acesulfame potassium, stilbenox TM (grapeseed extract). 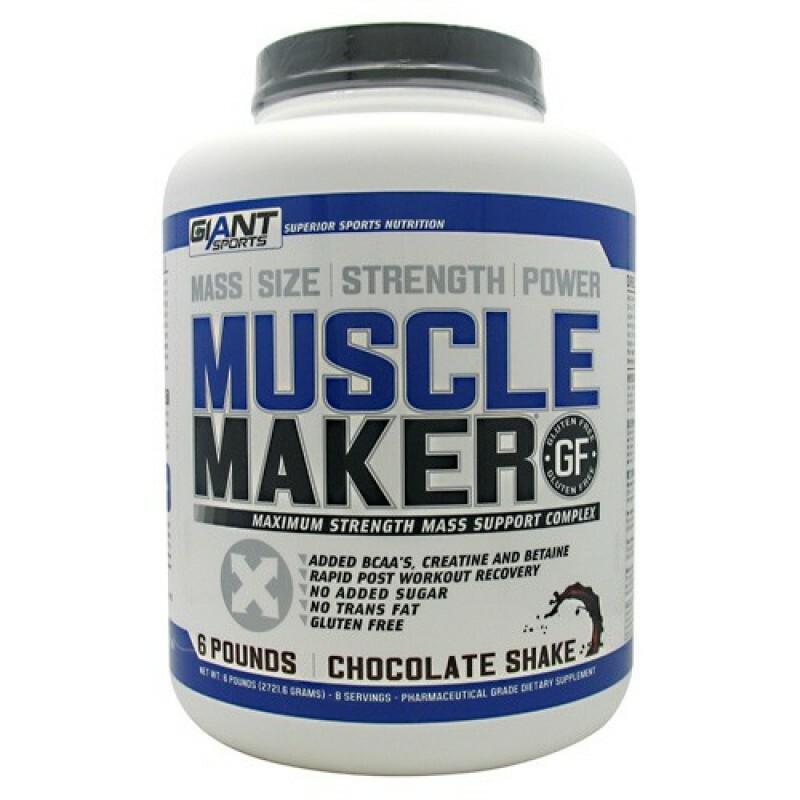 Muscle Maker by Giant Sports Products is a bodybuilding supplement scientifically formulated to deliver mass, size, strength, and power. With added BCAA's, creatine, and Betaine, Muscle Maker offers fast muscle recovery and development. It tastes great and mixes instantly. If you're looking to add quality lean muscle then grab a jug of Muscle Maker and let it do what it's supposed to do. Muscle Maker Gainer By Giant Sports Ingredients: maltodextrin, whey protein concentrate, fibersol 2 soluble fiber, amino acid bland (l-leucine, l-isoleucine, l-valine, betaine), creatine monohydrate, cocoa powder, natural and artificial flavors, sunflower oil, gum blend (carboxymethyl cellulose gum, carrageenan, xanthan gum), sodium caseinate, mono and diglycerides, dipotassium phosphate, tricalcium phosphate, soy lecithin, enzyme blend (amylase, protease, lactase), salt, sucralose, acesulfame potassium, stilbenox TM (grapeseed extract). 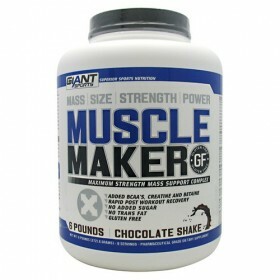 Muscle Maker Gainer Directions: In a shaker, blender or glass add one level scoop (36g) to 6-8 oz. of cold water, fat free milk or your favorite beverage according to desired taste. Shake, blend or stir until well mixed and dispersed. Consume immediately. May be blended with half a cup of ice cubes and half a cup of your favorite beverage for a cold, delicious treat. For optimal results, consume one to three servings per day. -Right After Exercise: Consume as a protein supplement immediately following exercise to support lean muscle and promote recovery from exercise. -Any Time of the Day: Use as a convenient and delicious way to supplement your protein needs in the morning, afternoon or in the evening. The protein and fiber in this product help satisfy hunger and support feelings of fullness. Muscle Maker Gainer Warnings: Contains ingredients from milk and soy.  Made in a plant that also processes egg, peanuts, tree nuts, crustaceans and wheat products. Start building muscle size and strength with Muscle Maker by Giant Sports Products & other Bodybuilding Supplements at rockhardsupplements.com.au Yatala and Gold Coast Stores.